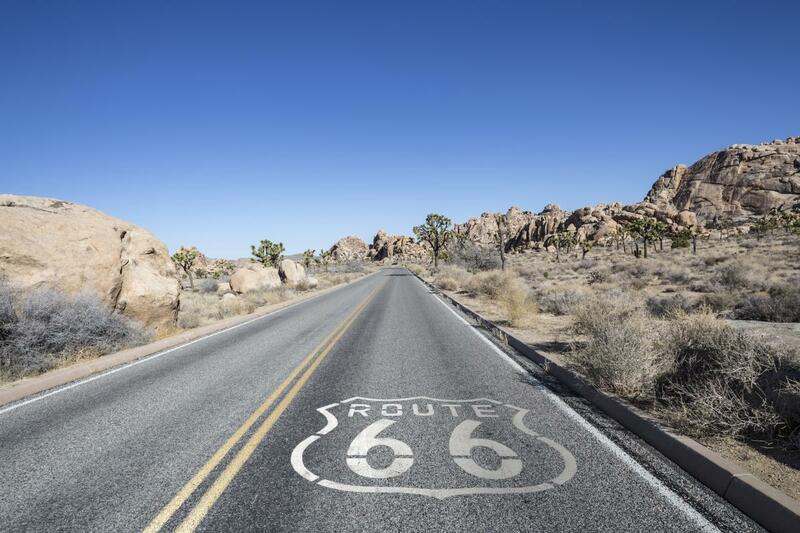 Depending on where you are from, you may know U.S. Route 66 by a number of names: Route 66, the Will Rogers Highway, Main Street of America or, affectionately, the Mother Road. No matter what you call it, the 1926-established highway that traverses 2,448 miles from Chicago to Santa Monica stands as one of the most famous roads in the country, made legendary through pop culture and Dust Bowl history. Over the Arizona border is the famous Old Trails Bridge, spanning the Colorado River with a soaring 600-foot arch. Once a part of Route 66, the deck of the bridge was removed in 1948 to carry a natural gas pipeline. Not far from the Arizona border into California is the Moabi exit that leads to Route 66 on the right. A left at the white bridge will take you to the Topock Maze, a 15-acre geoglyph consisting of patterns of parallel lines thought scraped into the desert by the Mohave Indian Tribe more than 600 years ago. The modern Mohave people believe the maze was a portal to the next life. El Garces at 950 Front Street in Needles is home to one of the famous rail stops built by Fred Harvey. Restoration of the historical grand old restaurant and hotel site is ongoing. From US 95, turn left at Goffs Road and continue to the Goffs Cultural Center & Mojave Desert Archives that is highlighted by the preserved 1914 one-room schoolhouse and rich trove of historical archives that trace the once active railroad town. 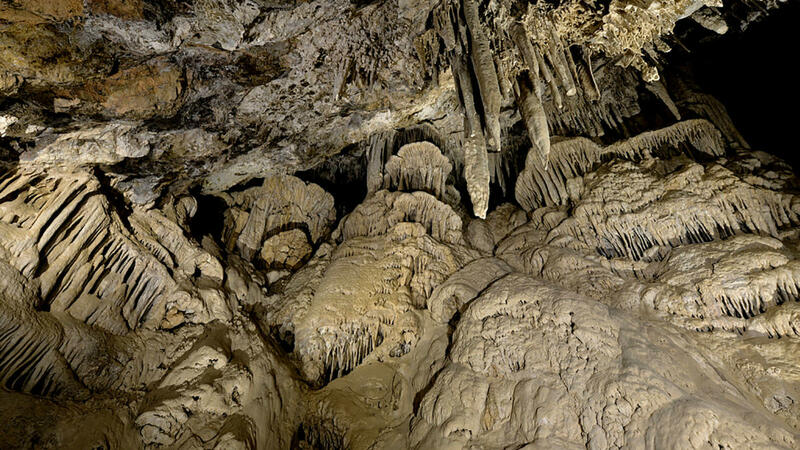 Northwest of Essex is the Providence Mountains State Park, home to the recently reopened Mitchell Caverns. Tours of the Mitchell Caverns is definitely worth a detour on your journey; reservations are required. See more here. Originally a town that supported the nearby mines and railroading, Amboy still boasts the 1938-established Roy’s Café and Hotel and gas station with famous sign. Now owned by Albert Okura of Juan Pollo restaurant fame, plans are underway to restore the businesses. Designated a National Natural Landmark in 1973 and located just off historic Route 66, Amboy Crater is an almost perfectly symmetrical volcanic cinder cone. This 250-foot-high geologic wonder in the Mojave National Preserve landscape provides panoramic views of some astounding features, including a 26-mile lava flow, Bristol Dry Lake and the Marble Mountains. Discover more Geological Wonders here. Although once a thriving railroad town with its own Harvey House, not much remains of Bagdad today other than a small cemetery and broken remains. Unlike Bagdad, Ludlow is not quite a ghost town. The once welcoming stop for passing motorists with a motor court, café and gas station no longer exists, however a newer Ludlow just north of the off-ramp of Interstate 40 reemerged in the 1970s to serve the traveler once again with gas stations, a small motel and a newer Ludlow Café and a Dairy Queen. In Newberry Springs, at the foot of the mountains on the south side of Route 66, you will find another landmark of the roadway—the Bagdad Café. Mention the name to French tourists who come by the busload, and they will tell you about its cinematic cult allure. Formally known as the Sidewinder Café, the tiny café gained international fame when the movie “The Bagdad Café” was filmed there. Its flamboyant owner, Andrea Pruett, holds court and is a celebrity in her own right. Originally a milling town for the nearby Calico silver mines, the town of Daggett was a busy center until mining operations shifted. Later, it was the home of Solar One and still operates some solar activities, an airport and light industry. Look for the landmark Stone Hotel. The Harvey House, Barstow: Probably the most recognizable symbol of Barstow’s train heritage is the Harvey House, built in 1910. 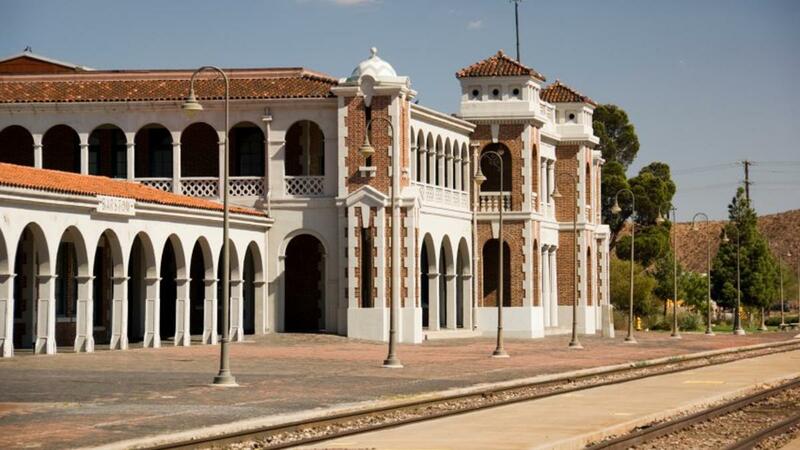 Listed on the National Register of Historic Places, the once elegant rail depot, restaurant and hotel complex was designed by renowned Fred Harvey Company with a blend of Spanish Renaissance and Classical Revival architecture styles. Route 66 Mother Road Museum: The museum displays an ever-growing collection of historic photographs and artifacts related to Route 66 Main Street in Barstow, and exhibits give a fascinating historical view of the development of the roadway, from early pioneer trails and the automobile. Barstow Murals: Barstow is also known for its historic murals that line the old town area along Route 66’s Main Street. Take a self-guided tour of 15 murals that grace the sides of downtown structures for a drive-by history lesson of the area. ​Find more on Barstow here.